Hagerstown, MD – Nelson Frederick Deal, 87, of Hagerstown, MD and formerly of Williamsport, MD passed away on Sunday, March 24, 2019 at his home. He was born on March 26, 1931 in Hagerstown, MD to the late Albert Nelson and Pauline Belle Zeigler Deal. Nelson was a 1948 graduate of St. Mary’s High School Hagerstown, MD and a 1952 graduate of Mt. St. Mary’s College. He was the Owner and Operator of N&W Train Shed in Williamsport, MD until his retirement in 2004. He was a veteran of the U.S. Marines serving during the Korean War. 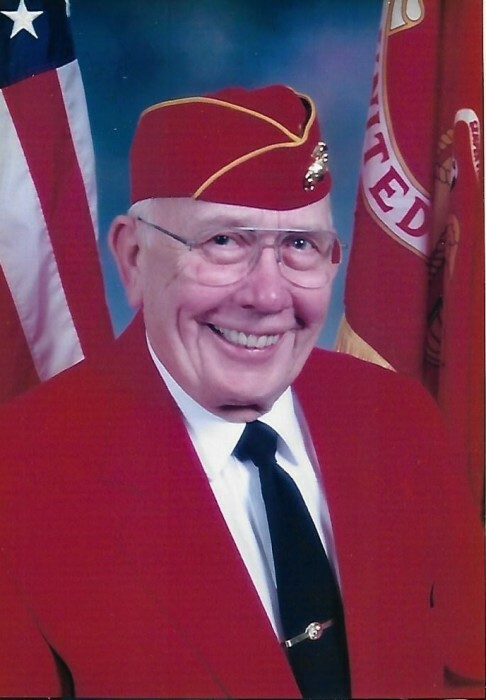 He served as a Drill Instructor at Parris Island ,SC before being commissioned on May 1, 1953. Nelson was a student of Wernher Von Braun and was one of the first guided Missile Specialists in U.S. Marine Corps. Nelson was a 50 year member of St. Augustine’s Roman Catholic Church Williamsport, MD. He was also a member of Knights of Columbus Pangborn Council #1365 of Hagerstown, MD; Potomac Post #202 American Legion Williamsport, MD; U.S. Marine Corps League of Hagerstown, MD; and Amvets Post #10 of Hagerstown, MD. He was a founding member and a longtime Umpire and Supporter of Conococheague Little League of Williamsport, MD. He started the River City Classic at Conococheague Little League and it was the first recognized 9-10 All Star Tournament in the Country. Nelson was the founding member and Narrator of the Williamsport Community Band known as the "Voice". He is survived by his wife of 65 years Norma Elizabeth “Betsy” Lowman Deal; daughter Margaret “Peggy” Wood of Old Hickory, TN; son Michael S. Deal of Millville, DE; son Albert G. Deal of Leitersburg, MD; son John F. Deal of Sagamore Hills, OH; son Bernard N. Deal of Torrance, CA; 7 grandchildren and two great grandchildren. He was predeceased by a daughter Elizabeth G. Deal and a son Thomas F. Deal. The family will receive friends at the Osborne Funeral Home 425 S. Conococheague St. Williamsport, MD on Wednesday, March 27, 2019 from 6:00-8:00 pm. The funeral home will be open after 9:00 am on Wednesday for the convenience of family and friends. A mass of Christian burial will be held at St. Mary’s Catholic Church 224 W. Washington St. Hagerstown, MD on Thursday, March 28, 2019 at 11:00 am with Father George Limmer celebrant. Interment will be in Rest Haven Cemetery Hagerstown, MD. Military honors will be provided by Joint Veteran Council of Washington County and Marine Corps League of Hagerstown, MD.